Setting up the Mobile big data Platform With the proliferation of smartphones with consumers and employees alike, mobility has been one of the most path breaking technologies to have emerged in the last decade. The past two years in particular have been quite productive for the industry, with Big Data’s influence growing through advancements in the sector. The evolving hardware in smartphones today has also created a great demand for advancements in the mobile platform. This has had the companies encompassed by the mobile sector preoccupied in an unending quest for innovations in the mobile platform technology. 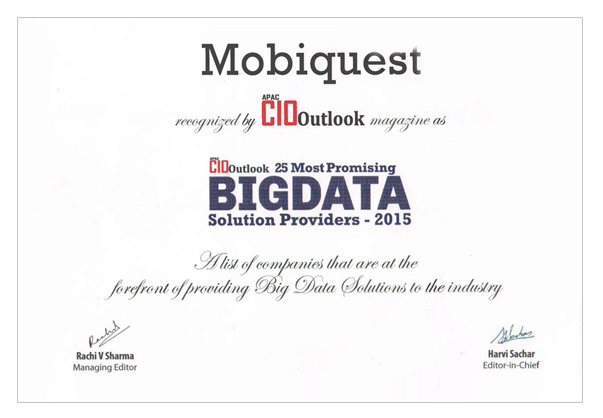 Mobiquest is one such innovator of this unique vertical that was focused on delivering the mobile loyalty & Analytics platform through the support of Big Data. Started in 2008, Mobiquest’s ascent into the market was through its flagship mobile data analysis platform m’loyal, which took two years to complete development and hit the market. Through m’loyal, Mobiquest wanted to accomplish the task of delivering the concept of POS data capture and mobile loyalty to the retail market which at the time was unaware of these ideas and were impervious to it. Mobiquest managed to break m’loyal into the market and its introduction illuminated the retail sector on the prospects of POS and the loyalty which later went on to aid them to a great extent in understanding the mindset and requirements of the clients. Despite the platform’s early success, getting it to the mainstream market was quiet the daunting task says Vineet Narang, CEO, Mobiquest. “On one hand it was a challenge to create & develop the market for a new concept, but on the other hand it showed us the huge potential and an open market space for the right DIY Loyalty platform,” Vineeth adds. Unlike most companies that develop a cluster of software for each requirement, Mobiquest initially put all its nest eggs in its champion platform m’loyal, constantly developing it to meet the market standards and succeed in its core objective i.e., to deliver market insights. While Mobiquest’s panacea for all problems model has served them well in the past, but changing trends dictates and change in strategy. Mobiquest’s m’LoyalPOINTS ATM™, m’LoyalREWARDS™ and the mloyalSHOP™ are the latest members of the company’s service portfolio, enabling retailers to take consumer engagements to the next level. The m’LoyalPOINTS ATM is a revolutionary innovation by Mobiquest that enables customers to draw loyalty points and shop for rewards through this multichannel retail platform. The Do it yourself (DIY) feature embedded in all of Mobiquest’s platform have made them self reliant and intuitive global support free usage. m’loyal in particular has advanced tools like Predictive Modeller and automated Customer Lifecycle Management Communications which enable retailer make marketing decisions through thorough analysis. Being a forerunner in a progressive industry, Mobiquest has huge prospects lying ahead of it. The company also intends to capitalize on its head start in the industry by establishing itself in both the domestic and international market including India, Singapore, Dubai and Malaysia which will bear witness to the new advancements in mobile that Mobiquest will be offering in the upcoming future.